This entry was posted in American Food, Entertaining, European Food, Fish & Seafood, Legumes, Mexican, Latin American & Southwestern Food, Middle Eastern food, Poultry & Rabbit, Recipes, Soups & Stocks, Thai Food, Vegan, Vegetables, Vegetarian or Veg-optional and tagged African, chickpeas, chipotle, chowder, coconut, corn, easy recipe, fennel, french, healthy, lentils, Mexican, Poultry & Rabbit, shrimp, soup, Vegan, Vegetarian. Bookmark the permalink. Sounds great! I’m going to try some of those. Soooo, i have been getting into cooking this winter and making soup weekly. I don’t mind eating the same thing everyday if it’s good. I mean, to a point I guess. So i have this thing down where on Saturday I’ll go to Eastern Market, buy some organic vegetables,whatever,stuff to make some kind of soup. Then i’ll get a hormone free chicken from one of the farmers there,they’re like $2.25-2.39 a pound. Take that home and brine it overnight. After the brining, I’ll roast it and eat half of the meat for some meal with some veggies, a salad, something like that. I’ll save the remainder of the chicken meat in the fridge. THEN, I’ll take the carcass and throw it in a big pot with carrots, onions, celery,a few garlic cloves, salt, peppercorns and make a stock overnight. So the next morning,I’ll strain the stock and put that in the fridge and let it sit until the fat rises to the surface, skim that off and there you have a ton of low fat chicken stock. Then, you make some kind of soup or whatever with the stock. I’ve been doing some kind of chicken,veggie, grain combo(like barely and rice) and that lasts me a few days at least. Anyway, just wanted to share my soup adventures. I love brining chicken and roasting it. 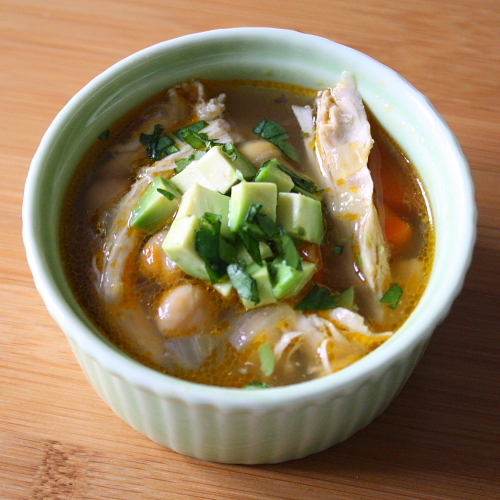 I did a post a while back on roast chicken and what I did with the leftovers (chicken stock, chicken salad with drippings…). Last year for our soup swap I made this tomato chickpea rosemary soup that was really good; I’m thinking of making it again tomorrow, it’s really easy & tasty. 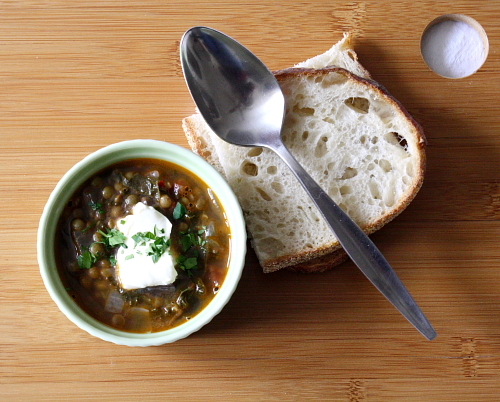 You would probably also really like the lentil soup Kate made. 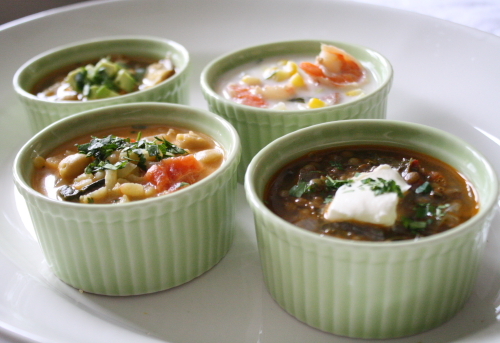 I found you via google balela recipes and information (if you go back you’ll read comment), but I have always said, one day a restaurant will figure it out and offer soup tastings! 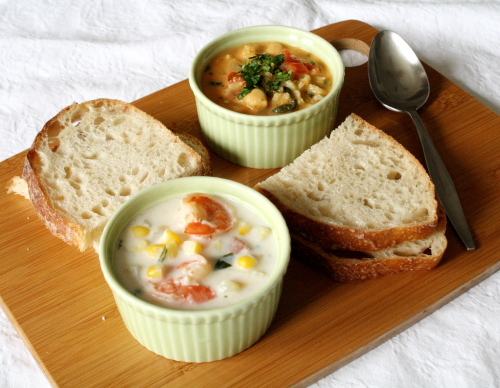 I had one once years ago, and since I love soup, this post caught my attention! They look so good all together! They really did compliment each other very well, I thought. I’m also thrilled that you liked mine, and I agree… more salt! When I typed up my blog that was one of the few things I changed. A BIG pinch of salt is definitely required. I think I’ll be making it again this week! I’m on a lentil kick at the moment. Wow, these sound great! 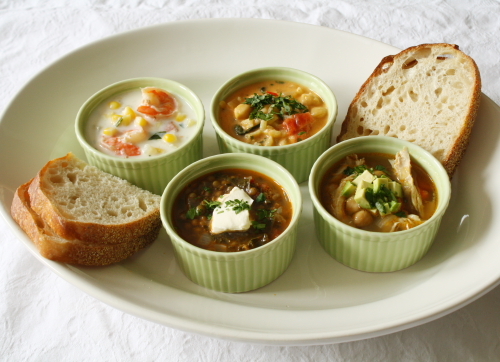 All these soups look so delicious and hearty-definitely good cold-weather food! The curried coconut soup looks tremendous! 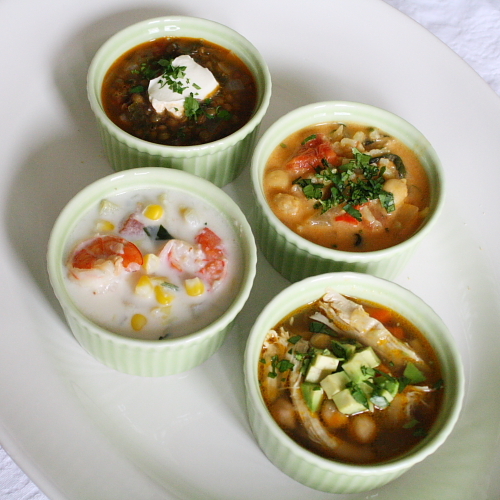 Thanks alot mate Noëlle, this is a really nice soup recipes 🙂 I’m bookmarking this page!! I can’t wait to make those soups. thanks! more power to you.